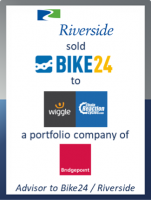 GCA Altium acted as exclusive financial advisor to The Riverside Company and the founder management on the sale of Bike24, a German online retailer of cycling and tri-sports equipment, accessories and apparel. Pending regulatory approval, the transaction is anticipated to close in the coming months. Riverside is not disclosing terms. "Bike24 had a well-known brand in the German region, but still had ample opportunity to grow," said Riverside Partner Michael Weber. "Together with an outstanding team at Bike24, we worked on numerous initiatives to drive growth. For instance, we made significant investments to upgrade the infrastructure by implementing an automated warehouse to expedite shipping and enhance inventory processes, and also strengthened the leadership team by bringing on board a strong CFO. It’s been a very successful partnership." Andrés Martin-Birner, Co-founder of Bike24, was pleased with the outcome. "We thank Riverside for the successful partnership over the past few years and look forward to joining forces with WiggleCRC," he said.